Earlier this year we had a poll regarding which distributions to review, and Sabayon received enough interest so here we are. 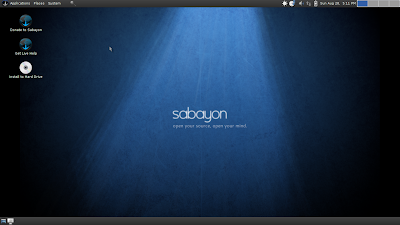 Besides, Sabayon Linux is always fun to try, to see which start up music and themes they come up with this time, and to play with the media center included. I also find the dark blue themes employed in recent versions quite appealing. A bit more than a year ago I had a look at the LXDE and Xfce spins of Sabayon 5.3 and came away quite unimpressed as they even refused to install on my low end hardware, but to be fair both these editions are still experimental and the advice is to use the more mature main GNOME and KDE editions. So today, with number 6 out, I'll finally write about those, and without hardware restrictions because I do not expect them to perform with less than 512 MB RAM. Some distributions still manage to do so, but Sabayon is known to be on the heavy side, and it isn't a problem on this Acer Aspire 5551 with 4GB. Sabayon is a customized distribution spin based on Gentoo, for those who don't fancy doing the whole compile and configure from absolute scratch. That's also already where the problem lies for me. What's the point of wanting to use a distribution whose strength it is apparently that everything is custom compiled for the machine it is on, when you then use a pre-compiled version of it done by somebody else on their machines. Why not just use any other binary distribution or ArchLinux as a happy medium, which does provide ready made packages but is both faster and just as configurable, with the option of compiling extra packages that you want to add to the small base should you be so inclined, or just go with what's available in the repository. Anyway, the choice is yours. The project very commendably offers all their spins in x86 and x86_64 architectures, and apart from the above several more spins with E17, a core image, an image labelled server base, and a spin base what I can only assume is intended for respins. 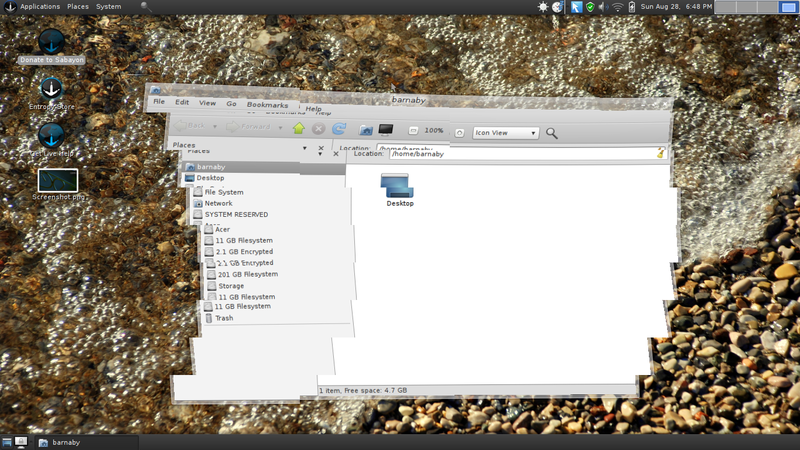 I downloaded the 32-bit GNOME version of Sabayon 6, mainly because at 1,561 MB (1.5 GB) it was the smallest image, with the KDE 4 images going well into the 2 GB. Not a problem for everybody, but well to consider depending where you live and your circumstances. 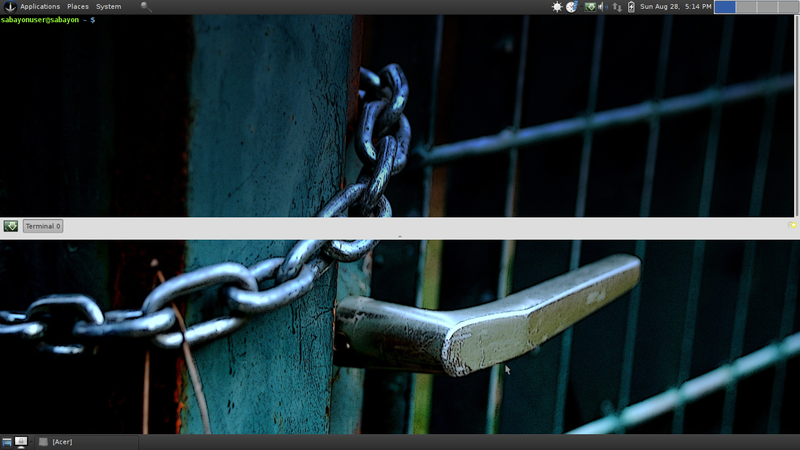 All images are also available per torrent, check out the release announcement on Distrowatch. The system can run live or can be installed, and I prepared a DVD for the first test run (actually, I've been using it for two weeks now on and off on quite a few test runs.) Booting up presents an array of choices, best described by looking at a screenshot. There are a few more further down though, incl. boot from hard drive and rescue boot loader which is an option that could come in handy, particularly among multi and dual booters when that OS has trashed your MBR again. If you chose to boot with music, this time you get something more out of an action movie instead of the usual metal. Positive things I noticed straight away were that the panel setup is slightly out of the ordinary, with virtual workspaces in the upper right and both power management and laptop screen brightness applets loaded. My Vodafone stick with Huawei chip was recognised immediately and a second later I found myself online, browsing from the live session. I noticed during one verbose start up that in fact several modules for these USB modems are loading, so there's a good chance yours will be supported. Compiz worked once the Fusion icon was clicked on. 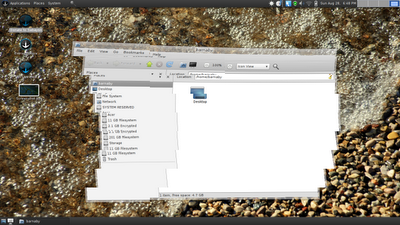 Sabayon also plays nice with Virtualbox, automatically scaling up to the highest wide screen resolution available. While all the above got my hopes up, trying to start XBMC media center from the Applications menu resulted in... nothing. There's an option in the boot menu to go straight into XBMC, but this also did not work and just resulted in a loop at the console login prompt with the X server crashing. Trying the media center graphical installation again yielded the same results. Edit: Hibernating did not work in live mode as no disk is specified, but suspend did and came back up in seconds. Looks wise Sabayon 6 is again using a darker blue wallpaper and an elegant customized Equinox Evolution theme with matte black panels and has included several light and dark variants. Backgrounds included on the other hand seem more an acquired taste and may appeal if you're into guerilla warfare or rusty metal poles and chains on your desktop. Perhaps it's supposed to be some sort of urban art, or just plays to a younger male audience in general, most of us have their own wallpaper collections anyway, and rather large ones at that, so it really doesn't matter. The Sabayon website btw is in the same dark blue and black tones, but I feel it could be easier to navigate. There are links to join or contact the community, to get involved or in the Enjoy Sabayon section to see some screenshots or download, but they almost get lost in the visual onslaught. Further down the page the inquiring user finds links to distribution news, the latest posts in forum activity and to what's happening on planet Sabayon, but collecting funds through donations seems more important. The software included is pretty decent. You get LibreOffice and Chromium from the start, the Quake style Guake drop down terminal, and I am pleased to note that Gnote is here instead of Tomboy, Shotwell for photo management, and nothing relying on mono included. Of course you would expect that from a distribution with the motto 'Open your source, open your mind'. The rest is more or less usual fare for a standard GNOME 2.32 desktop, with Exaile having replaced Rhythmbox, a PDF reader, Xchat and Pidgin, but for some reason no Gconf editor to change some of the settings. I was also happy to note that similar to Scientific Linux the 'Open in terminal' extension is installed in the shell menu, making this easier where ever you are in the file system. All in all a solid selection. Edit: Codecs for media playback and Adobe Flash are also on the DVD. Time to install this baby. I'm not going to go through all the steps in the installer, for that and package management please look at the previous article or on other websites. Suffice to say, Sabayon uses a modified Anaconda installer from Red Hat Linux/ Fedora, and booting from the Install in text mode entry brought me straight back to the day when I first tried to put Red Hat 5.1 on my drive. There are three ways to install Sabayon, the second being booting straight into the graphical installer which launches a Fluxbox environment. This ended for me when at the stage where the host name is set, whether you change it or not, with an unhandled exception error. Appeared familiar, I believe I have encountered the problem with Anaconda before. Third, I finally gave in and installed from the live environment, and this worked without any problems. A nice touch is that this installer allows you in custom setting to specify which partitions to format, and does not assume you need to format swap space again. Encrypting drives is also possible with the tick of a box, but I decided against it to better compare performance against other systems. You also get to choose where to install the boot loader and I went with chain loading from partition sda8. At the end you are asked whether to keep or remove all unused language packs. Removal is a good choice here as they can take up considerable space. All fine and dandy, after approx. 10 minutes of waiting on this 2.1GHz x3 core Sabayon 6 finally came up and detected some networks for me almost immediately that it had not seen while in live mode. Points for correctly detecting all my other operating systems and labeling the Windows Recovery Environment as such in the Grub2 menu. The installed system looks and behaves almost exactly like when running in live mode, with the exception of network manager as far as I could tell. XBMC still refused to start, and I gave up on it at this point. In a change to the positive, both suspend and hibernate worked fine and reliably and the system actually went down and came back up faster than some other distributions. Just a matter of seconds, and it felt solid. Sabayon includes the Magneto updater and the powerful Sulfur/Entropy combo for package management, so you won't miss important updates for long. A graphical firewall management interface is also included with Gufw. Combined with options in the installer this at least makes for a good system for security or privacy conscious people. 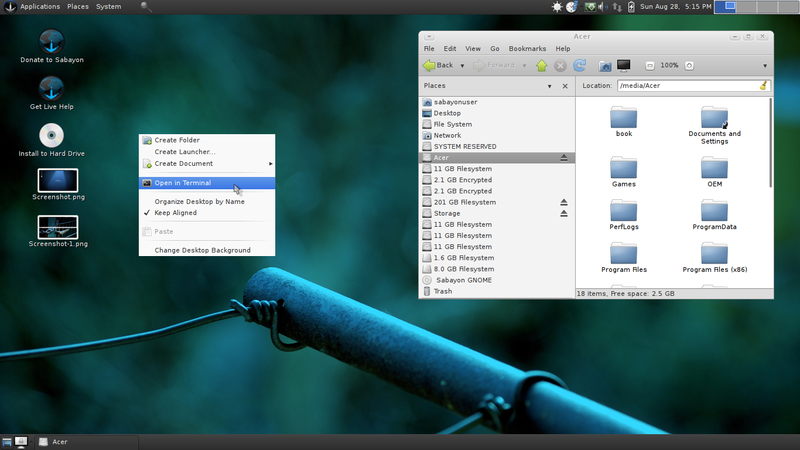 It isn't the fastest GNOME 2 system out there and is using upwards of 400 MB RAM just idling. Live it managed to do this with 302 MB as the lowest reading. While for the moment still an alternative for those wanting to stick with 2.x, I'ld also suggest Fusion Linux and Fuduntu to the enthusiast and hobbyist this is obviously meant for, both based on Fedora and due to this with the same features, encryption, LVM etc., in the installer. 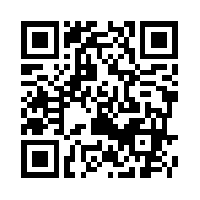 If you want to run a media server, from CD or installed, perhaps go for an earlier release and update from there. Overall, Sabayon 6 is a nice looking system, sleek and stylish, with a good selection of software, but like its predecessors it is unpredictable. Some things work really well, even better than in other distributions, others not at all. Sabayon is fun but as ever a mixed bag. I can't really recommend it other than to those already running it who will have their reasons. Read on for the x64 KDE spin of Sabayon 6. Re. XBMC: Apparently running “sudo liveinst-update-quick” updates the live image before install and is supposed to fix problems encountered. Alternatively, updating after install will fix it according to comments on http://www.linuxbsdos.com/2011/06/30/sabayon-6-kde-review/. Still, this does not inspire confidence. IMO a released image should've been tested to work as intended, or at least a respin issued taking care of the bugs. Then there's the oddity of others having encountered the same issue, but it seems at random. In the reviews at linuxbsdos.com XBMC worked on the Gnome 32 edition unlike here but did not work in the KDE version, where it worked for me on 64-bit. You are right, of course. I was thinking more of the possible consequences of using that technology, but that's more a philosophical preference. 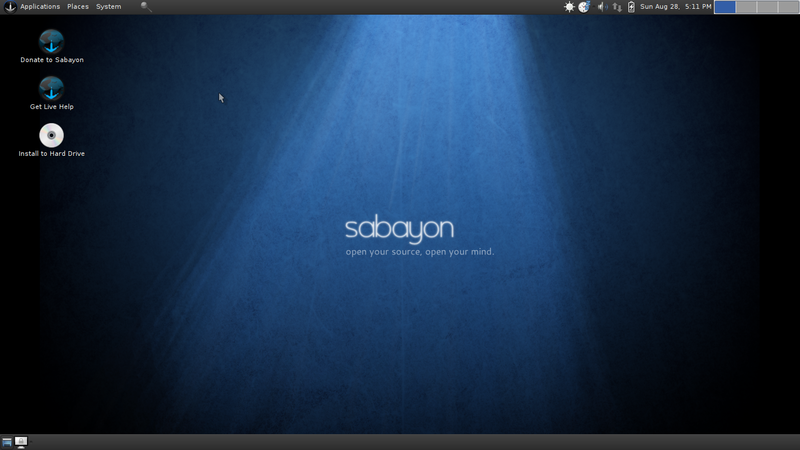 I have been running Sabayon since late 2006...but not as my only nor main Distro. Yes it's package are more the latest version rather then the older STABLE but as a Distribution I have always found Sabayon to be STABLE and to Work reliably ..
IMO if you like Gentoo base then it is a better and easier install.